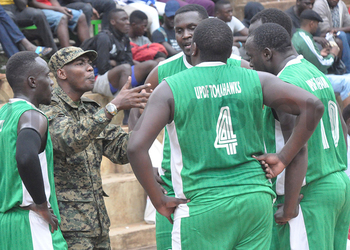 The UPDF Tomahawks overcame KCCA Men, 62-54 in the game played on Wednesday in the National Basketball league, Men’s division. Despite winning the first two quarters comfortably, the Army side had to hold off a spirited KCCA side that ensured that the scores where level going into the last (quarter). It was a tight a fair in the first quarter as both teams where neck to neck and with just over four minutes played; the scores where level at 4-4. UPDF started pulling away and by the time Felix Mukunzi sank a two-with just over a minute to play in quarter, KCCA were trailing by eight, the same difference that was maintained until the sound of the buzzer with the score board reading 19-11. Despite Waters Brian registering the first points of the second quarter, UPDF picked off from where they had left as Andrew Okot scored six of their 19-quarter points to ensure a 12 point lead going into half-time with the board reading 38-26 in the Army side’s favour. However in the third, KCCA proved that they would not go down so easily, scoring the first nine points of the quarter and in process bringing the deficit to within a mere three points, 35-38. With 54 seconds on the clock, KCCA’s Richard Ongom threw down a three point to bring the game level at 46-46, the first tie since four minutes into the first quarter. KCCA took their first lead in the game after throwing down the first three points of the final quarter. UPDF captain Moses Muhumuza made 2/2 of his free throws and his side regained the lead with just less than five minutes to play, score board reading 51-52. From there, Muhumuza scored seven of his teams last 10 points of the fourth and ensured that they seal a 62-54 win. Muhumuza top scored for his side with 13 points. He added four rebounds and one assist to his display off the bench. Felix Mukunzi was the other one who reached double figures for the army side with 12 points of his own, adding three rebounds and two assists. For KCCA, Waters Brian scored a game high 20 points adding four rebounds, four assists and two blocks. Francis Mbuyi, Enoch Munyagwa and Richard Ongom each registered eight points in KCCA’s losing effort. This was only UPDF’s second win over the season after defeating Ndejje Angels 76-70 in their second game. The Army side has lost the other nine games as their record stands at 2-9. For KCCA, They have lost all of their last six games in the league and seat second from bottom with a 2-8 record. 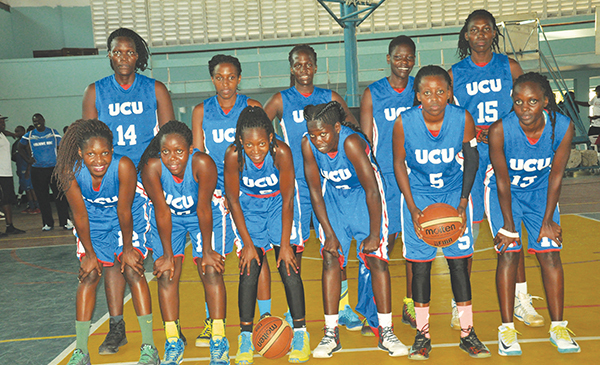 In the Women’s division, UCU lady Canons inflicted a sixth league loss of the season to Javon Lady Phenoms. The University side cruised from start to finish as the won the game by a whopping 41 points with the score board reading 66-25. UCU restricted the Phenoms to only two points in the first quarter, both of which were from the free-throw line with Faith Apio and Irene Akella both converting one of their two throws. The Phenoms looked to have improved in the second quarter, letting in only 12 points, a reduction of eight from the first and although they improved their points tally too, by six, it was not enough to stop the Canons from going into half time leading 32-8. The third quarter was more of a contest as UCU won it 16-15 and the score board read 48-23 going into the last 10 minutes. UCU produced another master-class in the final quarter, restricting the Phenoms to just two points while the University side registered 18 of their own to win the game 66-25. Lady Javon Phenoms’ two points in the last quarter were scored by their captain, Grace with just under a minute to play. UCU’s Among Annet top scored on the night with 14 points, adding four rebounds to her game. For the Phenoms, Ruth Atuhaire top scored for them with nine points and six rebounds. The win was UCU’s fourth of the season in six games while the Phenoms are still searching for only their second victory of the campaign. Their only win this season came thanks to a 53-45 win over the UMU Ravens last week. Action in both divison resumes on Friday, 22-06-2018 with the Javon Lady Phenoms taking on A1 Challenge (Ladies) while KIU Titans and BetWay Power lock horns in the Mens.